My Dad comes from a big family. Ten siblings all told. It is quite the crew. I have an uncle who was beginning high school when I was born and I have a cousin that is younger than another one of my cousin's daughters. I have aunts and uncles and cousins spread all over our great country. We don't get to see each other as much as we'd like to, but it's great when we do! We never have a problem drumming up conversation and enjoying each other's company. 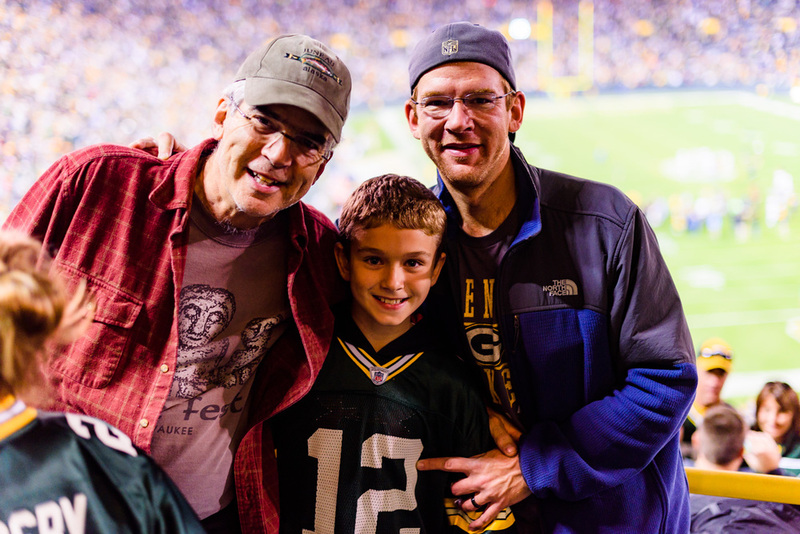 So glad my son Evan and I were able to make the trek to LA-LA-LA-LAMBEAU with my Dad, three of my uncles and two of my cousins. 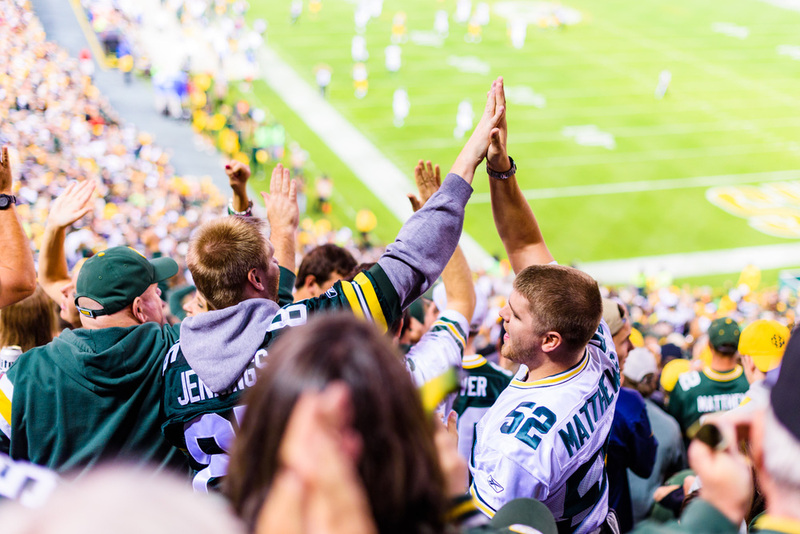 The Packers were squaring off against a very good Seattle Seahawks team. 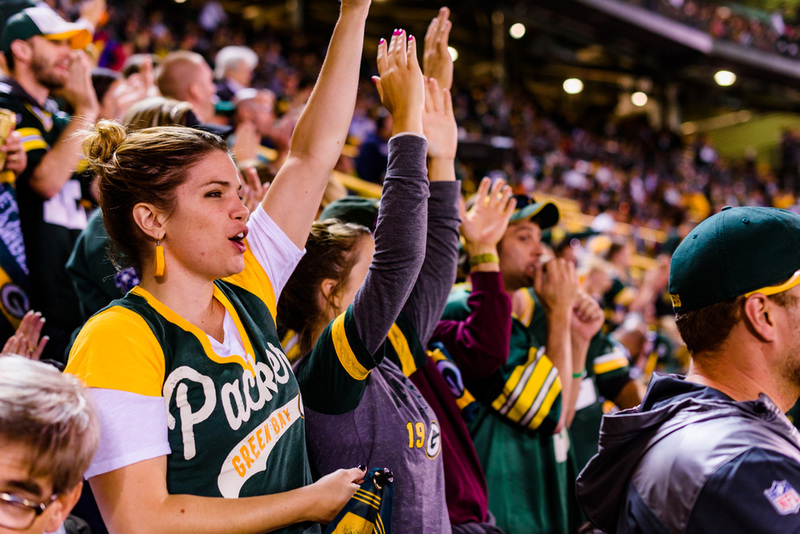 One that the Pack had developed a rare out of division rivalry over the past handful of years. 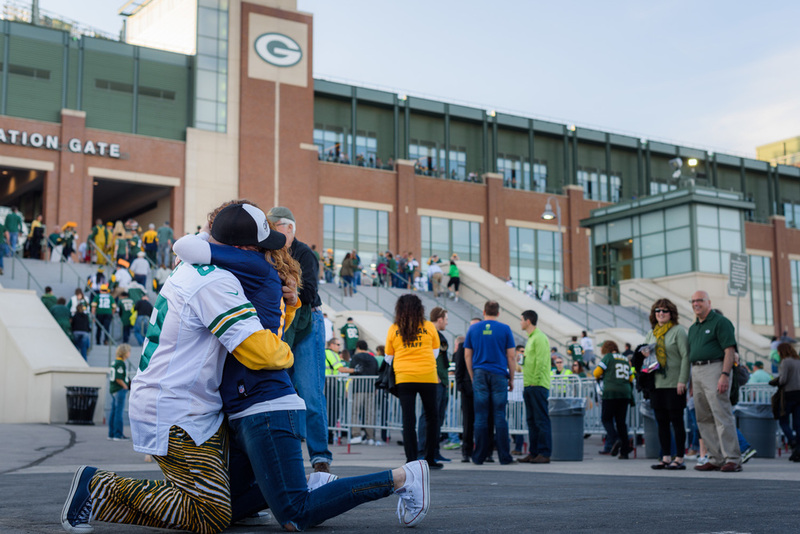 The last game left the Packers and their fans with an aching of revenge. I knew we'd be in for a great game... but I had no idea what I'd actually be getting myself into. I had just recently been booked by a fantastic couple to shoot their wedding next June. We met a week before this game. I had a great time at the first meeting with them and I'm really looking forward to getting to know them better and documenting their wedding day. Only catch is... Liz is a Seahawks fan. She's from Seattle, so she has a reason... but that only makes it understandable, not fully acceptable. Thankfully Scotty is a bleeding green-n-gold Packer fan. If I do the math in a certain way I could just consider them equal to a couple that doesn't follow football, so it's morally OK for me. Turns out that Liz and Scotty are going to this game as well. So we met up in the stadium before the game started and took some photos at their seats and took photos in the stadium. It was a really fun pre-game experience. 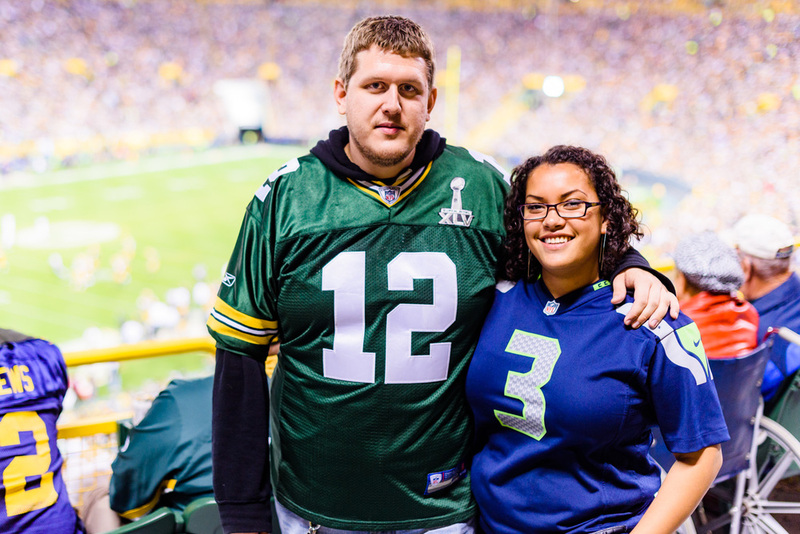 Since the Packers ended up winning I feel totally OK taking photos of someone wearing a Seahawks jersey... again, moral compass in check. As we're approaching the steps to enter through the atrium a couple is embracing just after she said yes to his proposal. Instantly I got down on my own knee, because I needed a better angle, and kept clicking away as Heather was being overcome with joy. 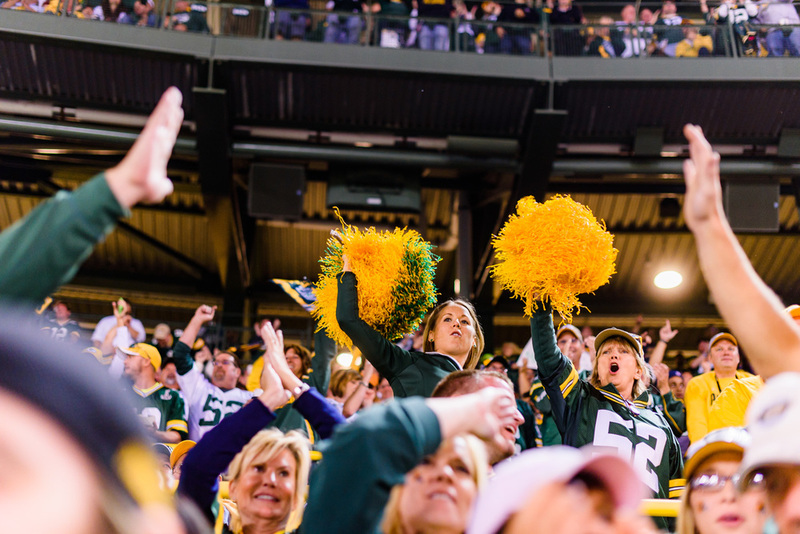 Not only was he wearing Zubaz, he was wearing a James Jones jersey and she was donned in an Aaron Rodgers jersey. What significance is this you ask? First score of the game, Rodgers to Jones on a beautiful 29 yard pass down the middle of the field. I gave my card to Cory and he contacted me the next day. So happy to have been able to get some photos for them! What a night! Recap; Father-Son time, Grand Father-Father-Grand Son time, Uncle and Cousin time, hanging with clients, surprise engagement, ZUBAZ... and oh yeah, the Packers won!